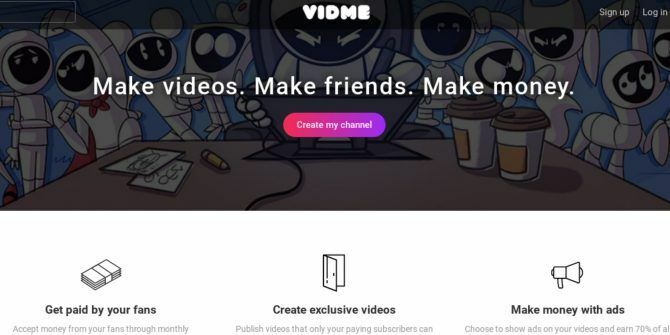 Vidme is shutting down, and it’s all the fault of Google and Facebook. The popular online video platform 10 Video Sites That Are Better Than YouTube 10 Video Sites That Are Better Than YouTube Here are some great alternative video sites to YouTube, although the "better than" is obviously open to debate... Read More will go offline on December 15th, 2017, at which point all videos will be “permanently deleted from the Vidme servers”. And with that, Google and Facebook’s stranglehold tightens. Vidme was launched in 2014. It originally offered a simplified take on the idea of online video-sharing, with people able to upload videos anonymously without needing to register. It then evolved into a hybrid of YouTube and Reddit, with curated categories and content creators. The site attracted millions of dollars in investment, and content creators started making some serious money. However, after just three years, Vidme is shutting up shop. And it’s because its competitors are so ubiquitous that it’s seemingly impossible for a new startup to succeed. In a blog post on Medium, Warren Shaeffer, the co-founder of Vidme, explained that the company “couldn’t find a path to sustainability”. Essentially, Shaeffer feels Google and Facebook hold all the aces, with multiple apps, user data, and the majority of online ad spending in the U.S. This meant it was impossible for Vidme to scale to sustainable levels. Not enough users switched from existing services, which made it difficult to attract advertisers, which meant there wasn’t enough money coming into cover infrastructure costs, let alone innovate to attract new users. New sign-ups and uploads are disabled already, and existing videos will be deleted on December 15th. All outstanding earnings will be paid out within 60 days, and paid subscribers will no longer be billed. Content creators The YouTube Starter Kit: 20 YouTubers Worth Watching The YouTube Starter Kit: 20 YouTubers Worth Watching There's a treasure trove of original content on YouTube. However, it's difficult to know where to begin. Let us help you with our list of 20 YouTubers that form the perfect YouTube starter kit. Read More should export their videos using the video manager ASAP. Did you ever use Vidme? Were you a viewer watching the user-generated content? Or were you a creator uploading videos to the site? Are you disappointed to see Vidme shutting down? What do you think is the ultimate cause of its failure? Please let us know in the comments below! The Realplayer software automatically creates "stories" from our collection of photos, which is kinda' cool, but many times I do not want to edit... I prefer to delete or have a "No" choice, but that simple feature does not exist and even though I can hit the red X to close out, it leaves me feeling like I am forced to use their software which is NOT a good feeling. Vidme died because it treated smaller content creators they didn't care about like crap and ignored criticism, labeling people like myself and a YouTuber called Eli The Computer Guy (and Eli clearly knew better than them how how to run their site) "trolls". They were rewarding blind praise and punished critisisim, even banned me from their subreddit for "reason: troll" when I raised some legitmate concerns about the direction they were taking their site. They also deverfied a prominent user named Kentantino and while no offical reason was given, Duffy basically implied in a Discord message he quickly deleted that it was because Kentantino had talked to Eli, which is also where he labeled Eli a troll. He was unable to keep this a secret however as he said this in front of the entire Vidme Discord server which was not offical and one of the mods posted the audit logs. Vidme was run by a bunch of manipulative, duplicitous self-centered morons and I'm glad it's gone. Thanks for the great article. Have you also used rawpixel.com for free images? Would love to hear what you think about it!